Looking forward to seeing all of you on Monday at the luncheon! I am sure I will be seeing a lot of red and green! Doors open at 11:30 a.m. and the program will begin at noon. Remember to purchase your raffle tickets prior to noon if you want an opportunity to take home one of the adorable gingerbread centerpieces. The tickets will be $1.00 per ticket or 6 tickets for $5.00. The Continental School Jazz Band and Chamber Orchestra will provide entertainment. We are truly privileged to be able to enjoy the efforts of these talented local youth making beautiful music. For those of you who have purchased your seats and feel you might have forgotten your table number, don’t be concerned the table number will be beside your name when you check in at registration. It’s YOTO Gift Bag Time! Remember to bring your holiday gift bag to the luncheon on Monday. Be sure to attach the card with the student name. When you arrive at the clubhouse please make sure you check in with a YOTO “holiday elf” (look for the folks with the YOTO star tags or Santa hats). They will check off your bag number and give you instructions for adding it to the display. If you are NOT attending the luncheon please make sure you drop off your bag at Diane’s House by Sunday, Dec 10 (2276 E Skywalker Way). Thank you all for helping make it a great holiday for YOTO students. Have you paid your 2018 Membership Dues? Dues of $25 are due by December 31, 2017. Applications for new members and renewals for current members will be available at the December luncheon or you may go directly to the website to complete the form and bring your renewal dues to the holiday luncheon, drop it in the box at Angie’s front door or mail it to Angie Werner at 1924 E. Orinda Lane. 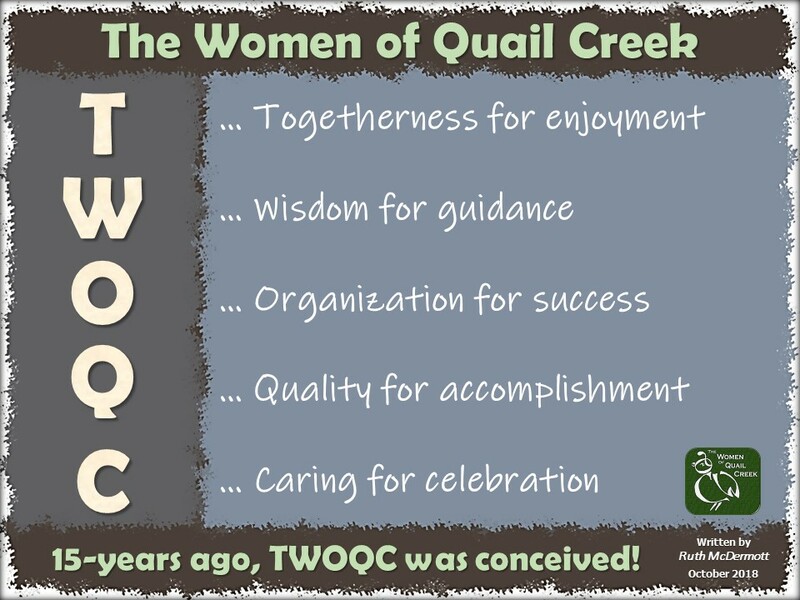 For any questions you may contact Angie at membership@womenqc.com. Monday, January 15 in the Madera Crystal Ballroom, the Quail Creek Education Committee and TWOQC Scholarship Committee will co-sponsor the second Kino Lecture “Arizona Jaguars: A Future in Limbo”. Randy Serraglio, Tucson Center for Biological Diversity, will share photographs and discuss the history of Arizona jaguars, their present plight and what must be done to ensure their survival. Tickets ($5) will be available at Monday’s luncheon (cash or check), at the door (cash or check) or at the HOA Concierge (checks only payable to TWOQC Charity Fund). All profits go to TWOQC’s Scholarship Fund. The ladies in this photo attended this weeks meeting for the 2018 Military Baby Shower. To date there are 11 moms-to-be that will be attending the event to be held at the National Guard base on Saturday, May 19. Volunteers are signing up for various committees that include cutting, sewing, knitting, crocheting, decorating, baking, shopping and fundraising. Please contact babyshower@womenqc.com if you would like to volunteer, donate items or have questions. The social worker for the couple who lost their possessions in the house fire received this note from them: “Oh Miss Jennifer, these things are lovely”. Thank you very much and please pass it on to the people who provided them for us. We truly appreciate them.” Thank you to those of you that donated. You have touched their lives in a very meaningful way. A table for donations of toiletries, calendars, greeting cards and holiday wrapping paper will be at the back of the ballroom at the luncheon.